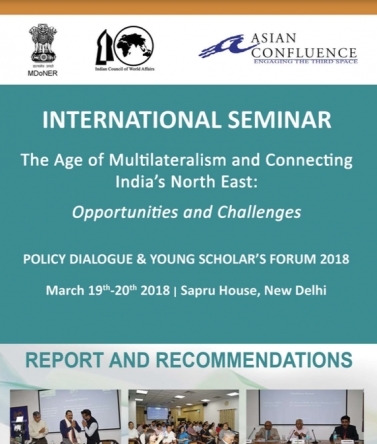 A two day international seminar was jointly organised by the Asian Confluence, a unit of Divyajeevan Foundation Society, Ministry of Development of the North Eastern Region (DoNER) and the Indian Council of World Affairs (ICWA), New Delhi,) on “The Age of Multilateralism and Connecting India’s Northeast: Opportunities and Challenges”. The seminar was attended by more than forty scholars from the Northeast, along with academicians from Bangladesh and Bhutan. Hon’ble Shri Jitendra Singh, Minister of State, DoNER was the Chief Guest in the Inaugural Session. The Valedictory session was attended by Shri Naveen Verma, Secretary, DoNER. Along with Ambassadors of Thailand, Myanmar, Bhutan and Bangladesh and the minister political from the Embassy of Japan, there were Joint Secretary (BM), MEA, representatives from Niti Ayog, Inland Waterways Authority, representative of the Government of Assam, and many other stakeholders who are involved in the and development of the North-eastern states and promoting the Act East Policy and Neighbourhood First Policy of the Government of India.